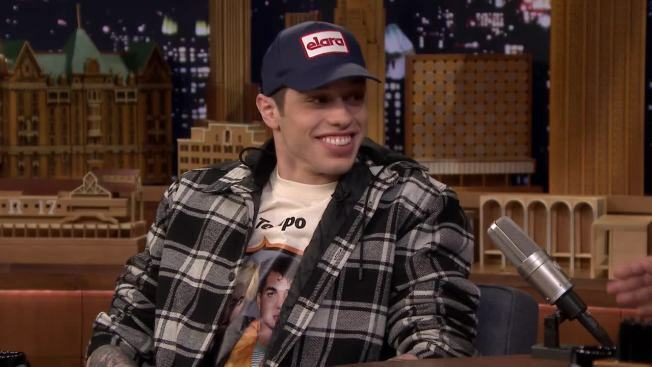 Officially confirming the engagement for the first time, Davidson told Jimmy Fallon he felt like he "won a f------ contest"
"SNL" star and Ariana Grande's brand new fiancé Pete Davidson made his first media appearance Wednesday on "The Tonight Show Starring Jimmy Fallon" since news of his engagement heard around the world shocked ... well, everyone. "You know you didn't have to get engaged to Ariana Grande just to come on our show," Fallon said. "But I did though," a giggling Davidson responded. Officially confirming the engagement for the first time, Davidson told the late night host he felt like he "won a f------ contest." Fallon was quick to offer the couple a potential wedding venue. "You know you could get married right here on the 'Tonight Show,'" Fallon offered. "Yeah," Davidson deadpanned. "That's not happening." With little prompting from Fallon, Davidson described the past few weeks following the whirlwind engagement to the pop princess. "It's lit Jimmy. It's so funny walking down the street. Dudes are walking by me and tipping their caps. Some dude came up to me and said, 'Yo man, you gave me hope.' I'm a lucky motherf-----." Davidson said he would happily "forever be known as her plus one."